Jaguar’s 2016 all-wheel-drive F-TYPE has paid dividends for Ricardo which has created the “most potent road-going sports car Jaguar has even made”. The programme – of which no doubt others will follow – appears to be another example of the successful meeting of minds that engineering teams at Jaguar and Ricardo enjoy. The choice of Ricardo as Jaguar’s engineering partner “was logical”, according to the Shoreham-by-Sea, Sussex business; it had already played a significant role in engineering all-wheel drive (AWD) variants of Jaguar XJ and XF. The latest contract further reinforces a close relationship that has developed over recent years between the two companies, especially as Ricardo has operations in the UK’s Midlands area, close to Jaguar’s Whitley engineering centre. An AWD F-TYPE created an even greater challenge for Ricardo given the sports car’s extremely low stance and trim, compact lines. With these, there was little opportunity, as Ricardo engineers might have wished, to grow the car’s envelope to absorb additional hardware. The magnitude of the challenge that faced Ricardo engineers cannot be over-stated. As might be visualised from F-TYPE’s configuration, namely front-engine with automatic transmission rear-wheel drive, to implement AWD implies complication and added weight – namely the transfer-box to take drive forward to the front axle (above). 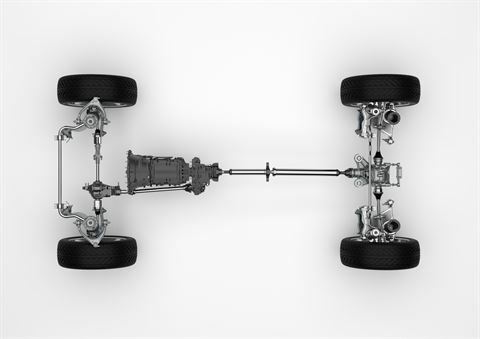 In addition, of course, embracing AWD means adding a differential and drive-shafts to the front axle where previously there were none. To add to engineers’ headaches, the drive shaft would need to pass beneath the engine and, to top it up, Jaguar required Ricardo’s engineers to maintain “satisfactory weight distribution”. The only sensible way forward to circumnavigate the constraints would be through the beauty of simulation. According to Ricardo, such a radical change to such a radical car would have far-reaching implications for other critical areas. It was important not to affect the “unmistakable Jaguar character of Jaguar DNA” in any way. And one can imagine when Penrdy says “We needed to go into an exceptional amount of detail to satisfy the core team at Jaguar and deliver the result with the minimum of intervention and support,” that he is referring to just the tip of an iceberg. Nine-tenths of Ricardo’s work is hidden from view. Adding AWD to a sports car originally intended as a rear-wheel drive automatic has a major impact on many of the car’s attributes, not the least of which being vehicle dynamics. Introducing a driven front axle could would likely impact on one such critical attribute – vehicle dynamics – one that gives a Jaguar its sporting characteristic, and one that can be traced back even before the E-Type. A modern Jaguar’s DNA comprises more than fine performance, handling and road-holding; premium levels of refinement and ride quality carry equal levels of importance. It can be visualised too that accommodating additional, major mechanical components within an existing envelope would impose their own set of challenges, notwithstanding the added burden imposed by changing the drive-line whilst still protecting the NVH attribute. On top of this had to be superimposed the attributes of vehicle dynamics, performance, economy and driveability. All are key elements of the F-TYPE’s character and with no compromise acceptable on any. Such was the extent of the challenge that faced Ricardo’s engineers when they embarked on their challenging assignment. Inevitably, some suspension hard points had to change and this required substantial CAE work to ensure that existing vehicle dynamics, handling and steering feel would not in any way be impaired. Customers could reasonably expect that an AWD F-TYPE should feel and perform at least as good, if not even better, than the existing car. In effect, Ricardo had to make a major, inner transformation which outwardly should not materially impact on either appearance or all-round performance. One of Ricardo’s biggest challenges of course was that of packaging: fitting in various new components with the minimum of disturbance. But in car design, introducing even one single, major component has a knock-on effect around the car. For example, in this case, accommodating the front differential and drive-shaft, the former of which is a significant item, not only in terms of size but weight, alone has major packaging implications. Inevitably, Ricardo engineers had to design a new aluminium sub-frame, along with new front knuckles through which the drive could be taken. These components in turn required new lower arms, and so it went on. The new sub-frame “slightly raised engine height” in the car to allow the front driveshaft to pass underneath. Other knock-on considerations were turning circle and wheel and tyre envelopes. Further, changes to engine installation inevitably required revision of other aspects, such as location of air intakes, cooling air flow paths, flow lines of various hoses and pipes, and of course location of air conditioning units. Equally important, the exhaust manifold and associated pipework needed rejigging to ensure necessary all-round clearances. Over-arching these was another prime requirement: any changes could not be allowed to adversely affect crash worthiness as “re-engineering front-end crash structures would be out of the question”. Added to which, the vital aspect of pedestrian safety of any car centres on clearance between bonnet and the hard points located below it to mitigate pedestrian injury in the event of a collision. This consideration opened up a further knock-on effect; one that Jaguar engineers could not ignore. As engine height had been raised slightly, and pedestrian injury clearances had to restored, Jaguar engineers were faced with little alternative. Even allowing for some reworking of the engine cover to ensure maximum clearance, engineers had to design another critical component – the bonnet; this is one component that body designers can agonise over for weeks. In this case, their new design had to contain an increase in the size of the power-bulge specifically to meet the AWD derivative’s demands. Of course, also, further along the car, the specification of ZF’s eight-speed ‘Quickshft’ automatic transmission required a transfer case to take power from the rear of the transmission to the front differential, causing “slight changes” to be made to the transmission tunnel. The transfer case includes a wet clutch-pack to control torque split between front and rear axles. Jaguar engineers developed a new software control system, dubbed Intelligent Driveline Dynamics – IDD, to handle this torque split. “That means we get great steering precision and the efficiency of a rear-wheel drive car, but with the additional traction through the front wheels precisely delivered to match the driver’s command to enhance traction, the road surface and the driving situation,” he adds. In normal driving, all torque is directed to the rear wheels. When required, torque is “smoothly and progressively apportioned to the front axle in a few milliseconds”. As well as front-rear torque split using the transfer box, IDD manages the interaction of the rear electronic active differential (EAD) to enhance traction of the V8 engine, torque vectoring by braking (TVbD) and Dynamic Stability Control (DSC) to maintain stability. Algorithms within IDD’s controller continually estimate surface friction with the controller using yaw rate, steering wheel angle, wheel speed, and lateral and longitudinal acceleration sensors. It also takes into account of the Driving Dynamics mode selected by the driver. Ricardo claims its work was delivered “on time” while the “depth of thinking and diligence paid off once again”. Ricardo makes the point that “however skilled an engineering team might be, a fresh set of eyes on a project can often pay dividends”. However, while the merits are obvious of ‘farming out’ a high-profile drive-line option to a high-profile specialist automotive company with specialist experience in driveline, especially for high-performance cars, it is more than likely there is a handful of engineers in Jaguar who would love to “have a crack” at tackling such a programme in house, given there is always the risk of it diverting attention from other main-line programmes which have to be pushed through on time.